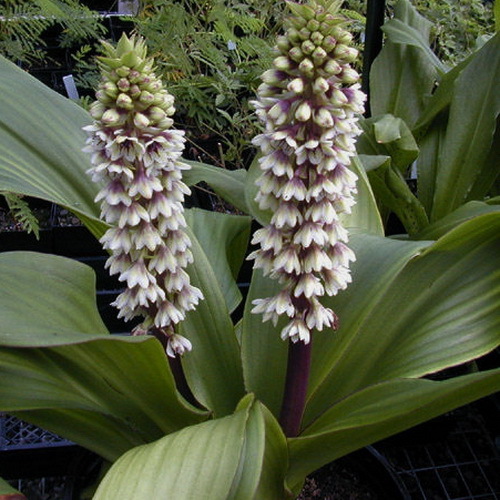 Eucomis montana has broad leaves that grow in a basal rosette and has wavy margins. They are usually purple spotted on their lower surfaces. The flowers are very showy. Plant in semi-shade in a fertile soil. 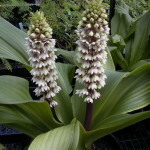 Eucomis montana has broad leaves that grow in a basal rosette and has wavy margins. They are usually purple spotted on their lower surfaces. 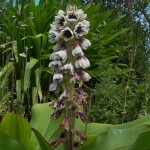 What is distinctive of Eucomis montana, is the colour contrast between pale tepals and purple stamens. While the tepals are pale lemon green to creamy, the dark maroon colour appearing inside the individual flowers, is given to it by the ring of large dark anthers and also the carpel, the style and ovary. The flowers are foetid, which helps to attract various fly species, the important pollinators. Don’t plant too close to your house.